Beth Russell of Morgan Ashley Salon can whip up a glamorous wedding-worthy ‘do like it’s her job — and maybe that’s because it is but we think she’s a natural. This friendly Birmingham native and stylist at Morgan Ashley Salon recently branched out from her home-base salon to also style hair on photo shoots and at weddings and the word about her talent is getting out. That’s why we approached her to show us how to create the uber-trendy top knot and the popular ropey ponytails — creative ponytails made using braids, knots and more. Beth dished on some hair secrets as she whipped up these fabulous updos. “People try to loosely braid their hair to get that soft look but it’s counter-intuitive,” says Beth. “If you want it to have staying power, start with a tight braid and loosen it from the bottom. You have more control over the look that way.” She also talked about the importance of hiding bobby pins and hair ties. Today, Beth brings us three gorgeous looks that capitalize on the trending top knot and ropey ponytail — with step-by-step instructions for how to achieve an elegant Viking braid, a windswept top knot and a Nordic ropey ponytail. Begin by spraying with a dry spray to give the hair some hold. Section off front “mohawk” zone and tease it forward to build a base and add height. Gently smooth teased section back. Pull the hair tie down a little to make way for the loosening of the braid. Wrap a strand of hair around the rubber band at the bottom and secure with a bobby pin in the back. This step hides the rubber band for a seamless look. Curl the hair and loosely style with a light layer of modeling creme to thicken and give a tousled look. This elegant braid combines a braided faux-hawk with long wavy tresses for a pretty yet powerful look. StyleBlueprint Birmingham’s own Bailey Torkelson models this fantastic look. Begin with a high ponytail. Pull some of the hair from the ponytail toward the forehead to add a voluminous look at the crown of the head. Tease the ponytail at the root near the hairband so the ponytail base is voluminous but also thick enough to secure bobby pins. Wrap the ponytail around in a sweeping circular motion, pinning it as you go. Keep it loose so the bun is more like a large, wild knot. Adapt to how the hair naturally falls, tailoring the top knot to work with your hair. Tease the strands that are left loose. Then gently smooth across bun and secure with bobby pins. Pull out some strands near the ears and nape of the neck. Curl and tousle a little for a gentle, natural look. This fabulous top knot is sleek and classic. A good hair day always puts a smile on your face. Begin with one small ponytail at the front section of head. Add a second. Divide the hair of the first ponytail and pull the second ponytail up between the two sections of the divided ponytail. Create a third section. Add the hair from the divided first ponytail to the hair from the third section to create a third ponytail. Tie it together. 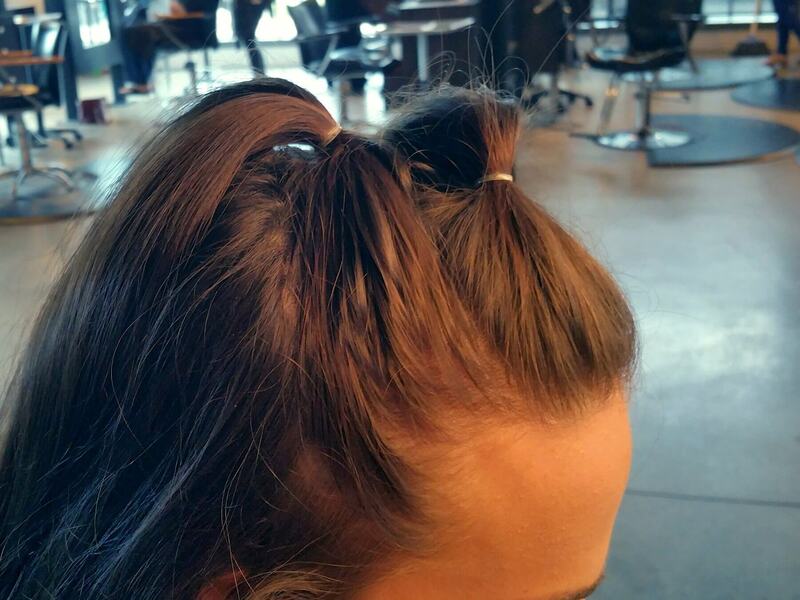 Divide the hair of the second ponytail. Pull the third ponytail up between the two sections of the divided second ponytail. Create a fourth section. Add the hair from the divided second ponytail to the hair from the fourth section to create a fourth ponytail. Tie it together. Divide the hair of the third ponytail and continue repeating the process until you are ready to complete the ropey ponytail. Starting from the bottom of the ropey ponytail and moving up, loosen the braid. This creative, one-of-a-kind hairstyle is simply gorgeous. Dress up this beautiful look with statement earrings and a cocktail dress or simply rock it with jeans and a t-shirt! Now, get ready to play with these looks on your own head of hair! Thank you to stylist Beth Russell of Morgan Ashley Salon for the insider scoop on how to get these fantastic looks!